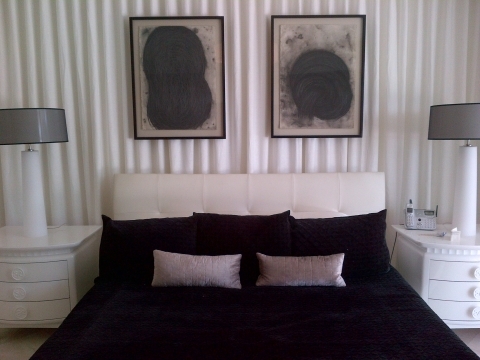 This project was completed today in Miami Beach and really added a nice touch to the master bedroom. Instead of a headboard, we covered the entire wall with a nice linen curtain in a ripplefold style. The pictures were mounted on extension brackets that come out through slits in the curtain, giving them a sleek floating look. On the sliding glass door we installed a large motorized solar shade along with matching motorized linen curtains. The customers were extremely happy with the finished product and we are now planning an upholstered wall for their living area. Brown Design is the company to call in Miami when you want your window treatments done right!